Northwest senior Chase McClay finished first in three different events at Friday’s Minford Invitational track meet. 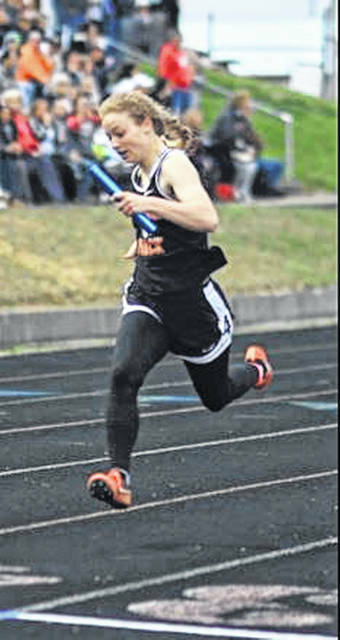 Wheelersburg’s girls’ track team finished first overall in Friday’s Minford Invitational track meet. 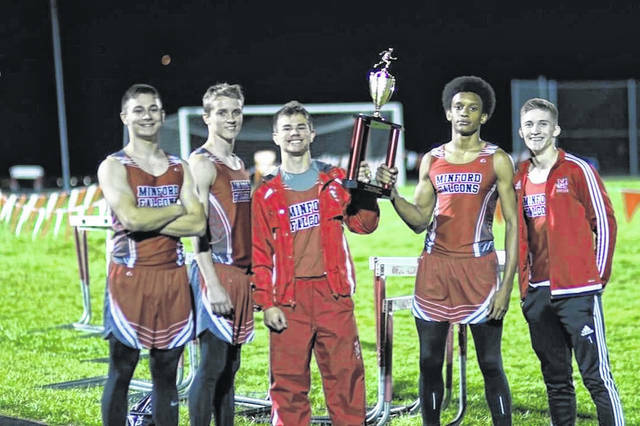 Minford’s boys’ track team finished first overrall in Friday’s Minford Invitational track meet. Pictured (L-R): Ethan Slusher, Bryson Ashley, Ty Wigett, Timmy Walk, and Luke Montavon. MINFORD – Friday evening, eight of Scioto County’s twelve high schools competed at the Minford High School Invitational track and field meet held at Minford High School. If just by a nose, the Minford boys’ track team took first place Friday in their own invitational by compiling a total of 120 points. Their relay team of Ben Adkins, Timmy Walk, and Luke Montavon finished first in the 4×200 meter relay by finishing with a time of 1:37.82. Walk and Montavon joined teammates Ethan Slusher and Ty Wiget in the 4×100 meter relay race to claim another first for the Falcons with a time of :46.35 seconds. Dutch Byrd added another first place to the Falcons tally on Friday by finishing first in the 3200 meter run with a time of 10:35.38. Minford’s final first place finish Friday came when sophomore Devon Risner vaulted 9-00.00. In girls’ competition, the Falcons finished eighth overall. Allison Wurts had the best individual for the Falcons by finishing second in the girls’ long jump with a length of 15-03.00. The Falcons 4×100 team consisting of Rilyn Ashley, Wurts, Rylie Reffit, and Amy Shoemaker finished third overall with a time of 56.80 seconds. Wheelersburg’s girls’ track team took the top place in Friday’s Minford Invitational with firsts in four different events. The Pirates team of Gabby Deacon, Lani Irwin, Allie Vallance, and Lauren Jolly took first in the 4×100 meter relay with a time of 54.13 seconds. Wheelersburg’s Libby Miller, Alyssa Dingus, Deacon and Irwin also finished tops in the 4×200 meter race with a time of 1:52.63. University of Findlay signee Paige Emnett picked up two first place finishes for the Pirates in discus with a distance of 107-07 and in shot put with a distance of 40-04.50. Wheelersburg’s boys team finished third place overall behind Minford and Northwest, but Wheelersburg’s Hunter Ruby had an excellent individual day in the boys competitions. Ruby took gold for the Pirates in the 100 meter dash with a time of 11.69 seconds, the 200 meter dash with a time of 23.51 seconds, and the 400 meter dash with a time of 52.70 seconds. With a combined 204.33 points between their boys’ and girls teams’, the Northwest Mohawks finished second only to Wheelersburg in cumulative points between both teams in Friday’s meet. Northwest finished with a meet high eleven first place finishes out of the 34 events held at Minford Friday night. The Mohawks boys’ team finished in second while their girls’ team finished in third Friday. In the boys’ competitions, Chase McClay had an incredible day. 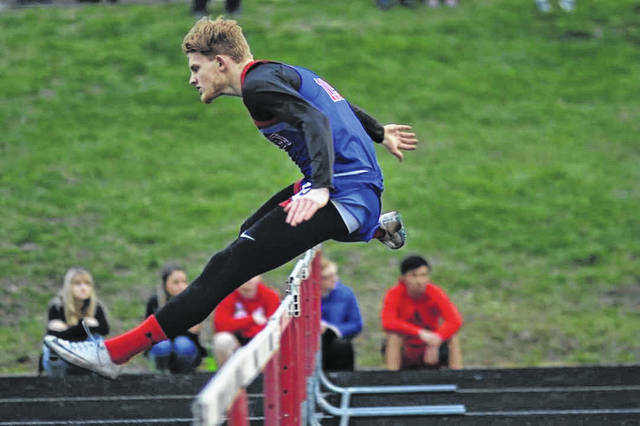 McClay alone finished with three first place finishes: in 110 meter hurdles with a time of 16.33 seconds, in 300 meter hurdles with a time of 41.86 seconds, and in long jump with a distance of 21-00.00. Landen Smith also first in two events for the Mohawks: one in the 1600 meter run with a time of 4:46.02, and the other in the 800 meter run with a time of 2:05.33. In team competitions, Northwest’s Evan Throckmorton, Kailan Marshall, Gabe Morrell, and Josh Shope took first in the 4×800 meter relay with a time of 9:02.29. In the 4×400 meter relay, Throckmorton and Shope were joined by McClay and Brayden Campbell to take first place with a time of 3:41.57. Haidyn Wamsley had a big individual day as well for Northwest by finishing first in three competitions: in 100 meter hurdles with a time of 16.80 seconds, in girls high jump with a distance of 5-00.00, and in long jump with a distance of 15-04.00. South Webster finished fifth in the boys’ rankings at Friday’s Minford Invitational while the Jeeps girls’ team finished seventh overall. Jeeps senior Olivia Messer picked up two of the Jeeps three first place finishes Friday: one in the 800 meter run with a time of 2:41.45 and the other in the 3200 meter run with a time of 13:22.41. South Webster freshman Trae Zimmerman finished first in the boys’ high jump with a distance of 5-06.00. Portsmouth West’s boys’ team finished in 6th place overall at Friday’s Minford Invitational while the girls’ team finished tied for 13th. Junior William Journey finished third in 110 meter hurdles with a time of 17.17 seconds while sophomore Caleb Davis finished in second in boys’ high jump with a distance of 5-04.00. Valley junior Jacob Brickley won the lone event for the Indians at Friday’s event in shot put with a distance of 44-09.00. Brickley also finished third in discus throw with a distance of 114-08. Junior teammate Levi Williams finished fifth in discus throw with a distance of 110.05. In girls’ competition, junior Karsyn Conaway finished in fifth place in the 200 meter dash with a time of 29.27 seconds and in fourth place in the high jump with a distance of 4-08.00. Valley’s boys’ team finished in seventh place overall while the girls’ team finished in tenth. Notre Dame’s team of Kaira McKinney, Catherine Brickey, Kalie Pettay, and Olivia Smith finished second overall in the 4×800 meter relay with a time of 11:57.29 seconds. Smith also finished sixth in 300 meter hurdles with a time of 53.97 seconds. In boys’ competition, senior Simon Harting finished fifth in the 400 meter dash with a time of 54.83 seconds while fellow senior Fred Gillenwater finished sixth with a time of 55.33 seconds. Harting picked up another fifth place finish in the 200 meter dash with a time of 24.72 seconds. Both Notre Dame’s boys’ and girls’ teams finished in eleventh place overall in Friday’s meet. Clay’s team of Cameron Delotell, Brianna Bennett, Chasten Davis, and Alex Musser finished sixth overall in the girls 4×800 meter relay with a time of 13:13.97. Tabbi Whitt and McKayla Collins finished sixth and seventh respectively in the discus throw to round out the Panther points in Friday’s competition. Clay finished 12th overall in girls’ competition while the boys’ team finished twelfth overall Friday. For full lists of names, times, events, as well as teams and where they placed, please visit http://www.baumspage.com/track/minford/2019/Results.htm.